**Product received for review. All thoughts are 100% my own. When I first learned that I was having a baby girl, I was ECSTATIC! Don't get me wrong, I had so loved being a boy mom, and would gladly have taken another boy had God so chosen to give me one, but let's be honest--- girls are soooo much fun to shop for! You don't just have toys, you have jewelry and makeup, nail polish, dress up clothes, fancy journals... Often when I am shopping for gifts for my children, I notice that I can always find so many more things I love for my little girl! Smitco offers quality, affordable gifts for girls ages 2 to 12. SmitCo has several different diaries with lock and keys and diary sets for girls in Emoji and Diva themes, as well as several different nail art sets to provide hours of fun. SmitCo products also include rose gold, gold or rhodium plated jewelry and sets, as well as very popular stretch sets for little girls - all packed in cute gift boxes. They sound fun, right? I was recently given the chance to choose just one SmitCo product to try out for myself. Oh, what a decision that was! Immediately, I fell in love with...well all of it! I loved the affordable dress up sets, perfect for my little girl who dreams of being a princess. I loved the cute journal sets--- mermaids? emojis? My daugher loved them both. (Though being just 3, they seemed a little out of her skill level.) I fell in love with the jewelry, both the more kid-friendly styles and the metal necklaces too. 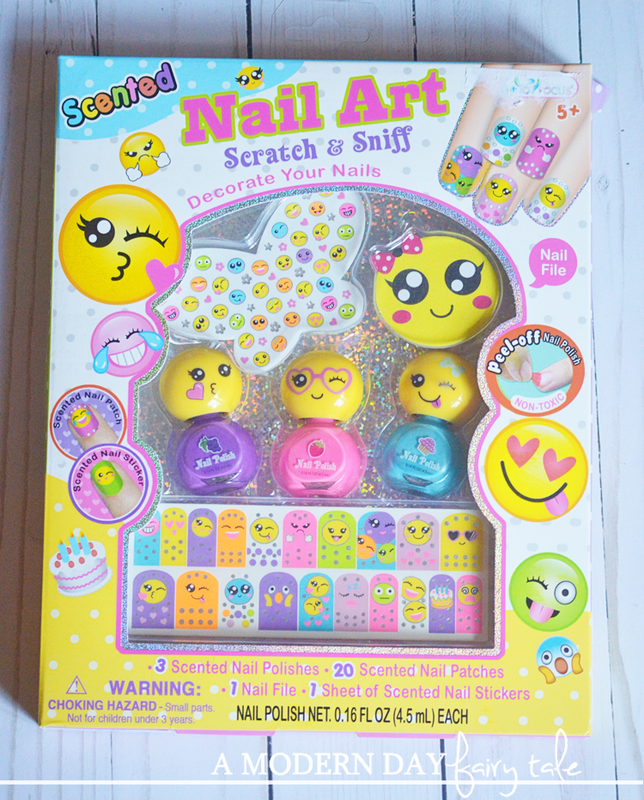 Like I said, it was a TOUGH choice, but ultimately, I HAD to go with the Emoji Scratch and Sniff Nail Art Set! My daughter LOVES having her nails painted. It truly is one of her favorite things--- up there with, well, emojis! What a fun fit! So, I knew she would love this set! Boy, was I right! She immediately fell in love with everything! She loved the fun nail polish bottles, the cute stickers, and while they were too large for her toddler fingers she loved the nail patches too. Mostly, she loved the fun added twist that these were scented! Theyy had fun fruity smells that made painting our nails even more fun. One other thing about my daughter and her love of nail polish? She loves to CHANGE it. Pink one day, blue the next... I loved that this is a kid friendly nail polish that just peels right off whenever she is ready to make the change! Overall, we both really loved this set and look forward to seeing and buying more from SmitCo in the future. You can see everything they have to offer here.